I find myself in a mild state of shock, disbelief, confusion and it’s not because of the So Cal fires. I don’t even know how to start this. I guess I’ll start from the beginning. I read an interesting post by Jeff Woelker yesterday. The posted pondered whether Ask.com dropped by the ball with its recent commercial touting the blended search results users get when they perform a search for singer KT Tunstall. 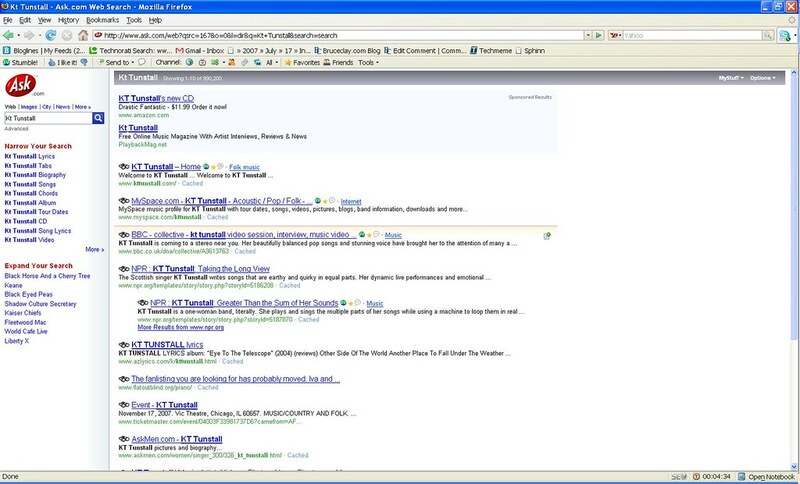 Jeff was impressed by Ask’s blended search results and wanted to share the commercial with friends. However, when he tried to find it, he couldn’t. It was nowhere to be found. Bummer. And he wasn’t the only one disappointed by that. There was apparently an entire thread on a KT Tunstall discussion board regarding the missing video. Crazy, right? I mean who knew KT Tunstall had fans? I found myself agreeing with Jeff. I think it would have been smart for Ask.com to put the videos of their (awesome!) new commercials online and allow users to share them with their friends. Let’s get that whole viral thing going. I thought maybe I’d try to help Jeff out and see if I could find the commercial myself and then send him the link. However, now I have an entirely different problem with Ask regarding that commercial. A huge, huge one. In the commercial, a magic hand appears to perform a query for KT Tunstall. 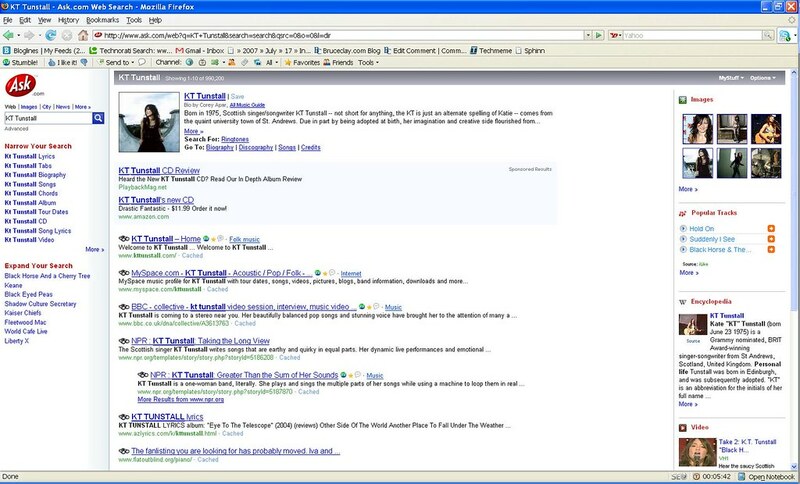 And when the search is pulled up, viewers see a beautiful blended search results for the artist, complete with pictures, audio clips, concert dates, and lots of other wonderful unique-to-Ask things. In the commercial, Ask.com is shown as being truly awesome. Here’s what happened when I did a search for [kt tunstall] in an attempt to find the video. Um, hello? Where is the blended search result? There are no pictures, no video, nothing besides 10 blue links. Ask, you lied to me! I calmed down and thought, okay, how about Kt Tunstall? 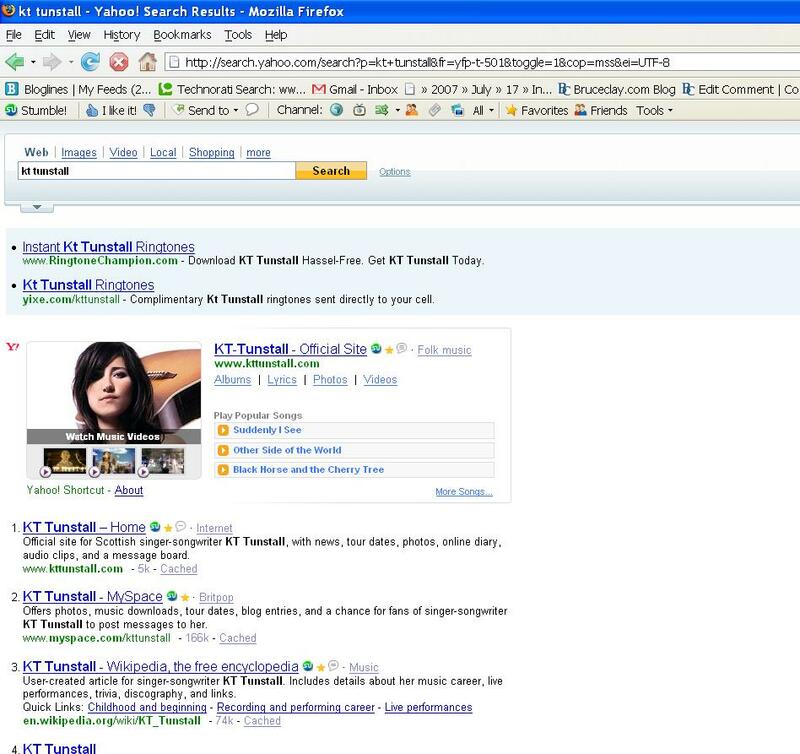 I tried a few other permutations and discovered that the blended search result will only appear 100 percent of the time if a user types in "Kt tunstall" or "Kt Tunstall". Apparently, capitalizing that initial K is a really big deal. Ask, I love you more than any other SEO blogger in the whole world loves you, but this is not okay. You need to be better at meeting user expectations. Your blended search offering is by far the most impressive out there. You’re schooling everyone. But you can’t run a commercial to get people excited about what you’re doing and then drop the ball. You have to deliver what you’re promising. It’s the only way searchers will ever trust you. Stuff like this is incredibly frustrating to searchers and is a sure way to alienate them. Either you’re going to make them feel lied to because you didn’t deliver what you promised them you would, or you’re going to make them feel dumb because they couldn’t replicate what they saw on TV. You don’t want your users to feel betrayed and you definitely don’t want them to feel like they’re not smart enough to use your search engine. 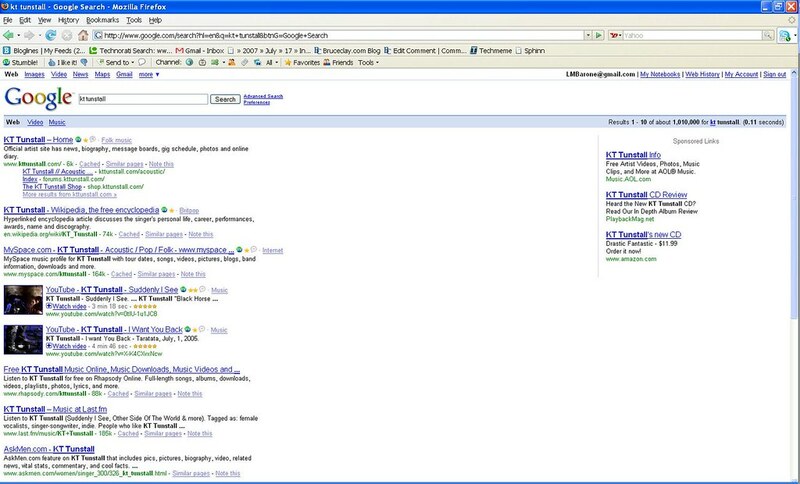 And what’s worse is that when the search fails on your engine they’re going to go try it on Google and Yahoo. And when you’re not running your totally awesome blended search result, their offers are better. It’s simple. If you’re going to run a commercial showing users how great results are for a specific query, it has to match up to what they’ll see in real time. And you can’t make their success rest on whether or not they used correct capitalization. That’s ridiculous. 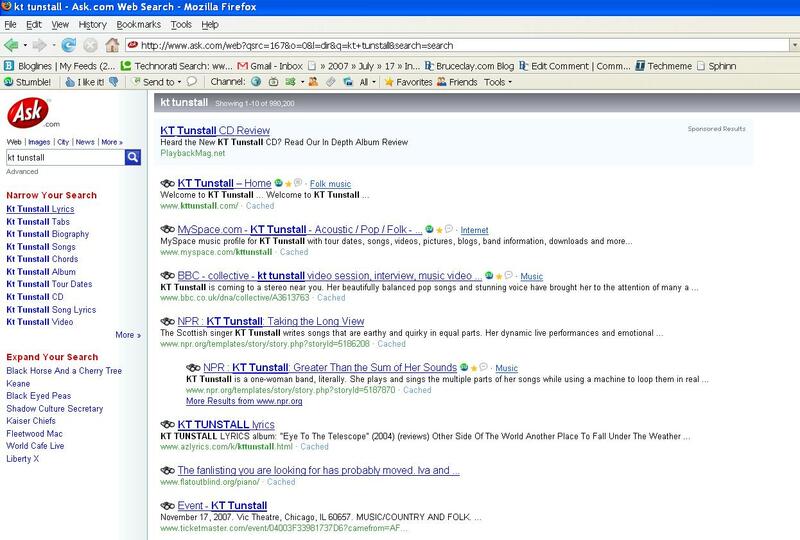 Guys, I don’t care if you have to hand edit the results for KT Tunstall; I won’t tell anyone. But make sure you’re delivering what your commercial is promising. Don’t make me hurt you. Update: Ask’s Gary Price assured me that this was just a rare technical glitch and that Ask’s blended search results are definitely NOT case sensitive. I tried my searches again and all of Ask’s superior blended search results appeared, so it looks like he was right. Thanks for the taking the time to look into this for me, guys! Lisa, you are so right… Ask’s take on the “Universal Search” interface is definitely superior to everything else out there. 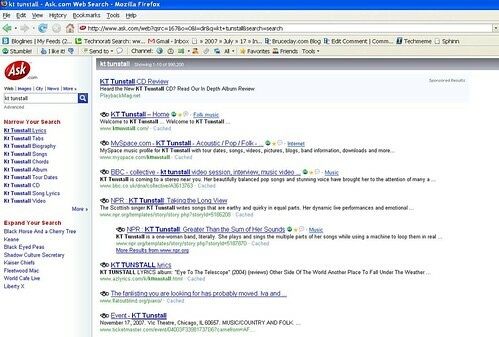 But their core search function is rubbish, and it’s silly little things like the kT tUnStalL (ugh!) issue you highlighted that make sure they will never reach the giddy heights that Google has without some serious changes atthe most granular level. I loved your post. Glad I could get the conversation started. I didn’t even know you could get those kind of results in Yahoo. I’ll update my post accordingly. Oh ouch! Ask seriously need to start doing things well. They have the right ideas, they just seem to fail at the execution.